Matthew Hall coaches CrossFit, lifts and throws out of Roanoke, VA. 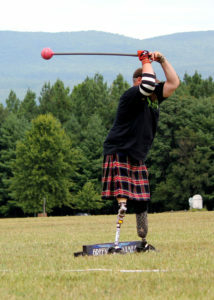 He is an above the knee and below the knee double amputee from birth defects. Matthew competes in Strongman and Highland Games. In high school, he wrestled and threw shot/discus. After high school, he wrestled at Appalachian State University and during his freshman season he suffered a knee injury that ended his competitive career. After 3 years at Appalachian State, he transferred to Radford University and finished a Bachelors of Social Work in 2003. After college, Matthew coached wrestling in the Roanoke Valley for 15 years coaching several state place winners, one individual state champion and five National High School Tournament Qualifiers. Matthew started CrossFit in 2008, placed second at the 2015 Working Wounded Games(Adaptive Crossfit Competition) and has been coaching at Railyard CrossFit for the past two years. Matthew worked in the mental health field, primarily with young adults, for 12 years before moving into a full-time position at Railyard Crossfit and part time manager at Greenridge Recreation Center. Matthew recently travelled to Iceland where he was able to lift Hálfsterkur, a 100 kg natural traditional lifting stone at Djúpalónssandur a sandy beach and bay on the foot of Snæfellsjökull glacier.